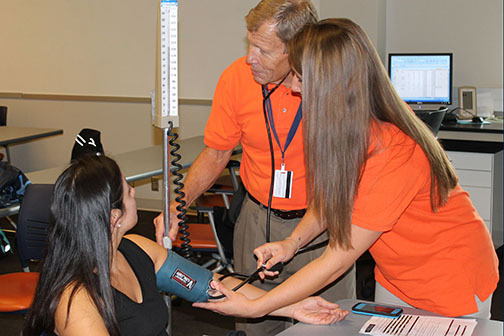 The TigerFit health and physical fitness assessment, sponsored by the Department of Kinesiology, will begin its spring assessments on February 23, and will continue until the last week of April. That is just in time for you to check out your current fitness level and get started on your training program for the beach. The TigerFit assessment is a comprehensive fitness evaluation that includes a cardiovascular disease risk assessment, cholesterol and blood glucose screening, assessments of pulmonary function, body composition and bone density, aerobic exercise testing with ECG and blood pressure, muscular endurance, flexibility, balance, and a musculoskeletal evaluation. Clients receive a report explaining their results and giving an individualized exercise program. Assessments take place on Monday and Wednesday mornings with appointments beginning at 7:30 a.m. The testing takes about one-and-a-half hours. The program is open to faculty, staff and their families, students, and as the schedule allows, individuals from the greater Auburn community. The cost for the assessment is as follows: Faculty, staff, their family members, and students – $25; Alumni and others – $50. To make your appointment please call the TigerFit Program at 844-1482 or email TigerFit here. Take the first step that will get you moving towards a healthier, more fit future.